1. We rode out there in my grandpa’s motor home. When you are 10, a motor home, literally a house on wheels, is the most amazing thing ever. “You mean, I can sit on this couch while we drive down the road! ?” Yes, yes you can little me. 2. My grandpa loves ice cream. Stops at Dairy Queen were mandatory. And frequent. So let’s recap: house on wheels, mandatory ice cream pitstops. It really is about the journey, not the destination. My love of frozen dairy has to be genetic then. A trait I proudly bear from my grandpa, and an addiction I only ever intend to enable thanks to my beautiful ice cream machine. 1. In a medium heatproof bowl, whisk the yolks just to break them up, then whisk in half of the sugar (1/4 cup). Set aside. 2. In a heavy nonreactive saucepan, stir together the cream, milk, salt and the remaining sugar (1/4 cup) and put the pan over medium-high heat. When the mixture approaches a bare simmer, reduce the heat to medium. 5. Strain the base through a fine-mesh strainer into a clean container. Set the container into an ice-water bath, wash your spatula and use it to stir the base occasionally until it is cool. Remove the container from the ice-water bath, cover with plastic wrap, and refrigerate the base for at least 2 hours or overnight. 6. While it cools, empty your cookie roll into a gallon-sized plastic bag. Using a rolling pin, or other solid object, break the cookies up into small pieces. 1. Whisk the peppermint extract into the chilled base. 2. Freeze in your ice cream machine according to the manufacturer’s instructions. While the ice cream is churning, put the container you’ll use to store the ice cream into the freezer. 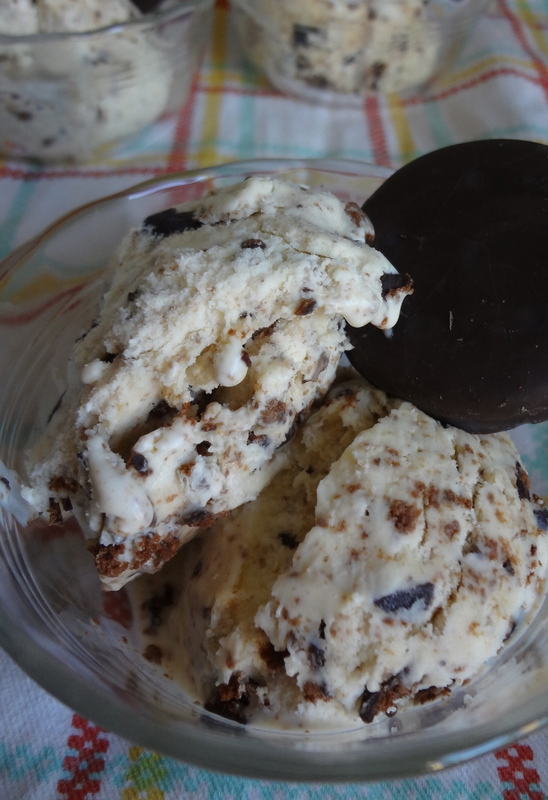 Add the cookie pieces in the last minute or so of churning, or fold them in by hand after transferring the ice cream to the chilled container. 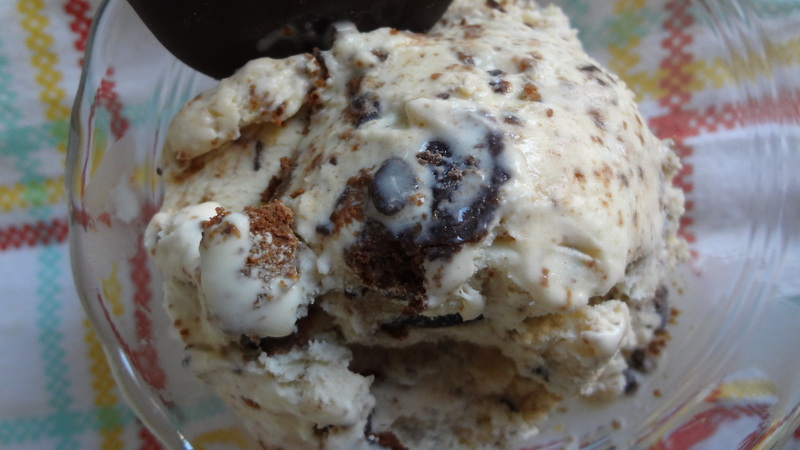 Enjoy right away or, for a firmer ice cream, freeze for at least 4 hours. This entry was posted in Uncategorized and tagged cookies and cream, Desserts, frozen desserts, girl scout cookie desserts, how to make ice cream, Ice Cream, thin mint desserts, thin mint ice cream, what to make with girl scout cookies by theculinarycapers. Bookmark the permalink.